You Ought to get ‘Spaced’ out ! After having reviewed guitarist, songwriter and producer, Jeff Jones’ album ‘RockHard’ , I was so eager to hear out more of his music. And I did. 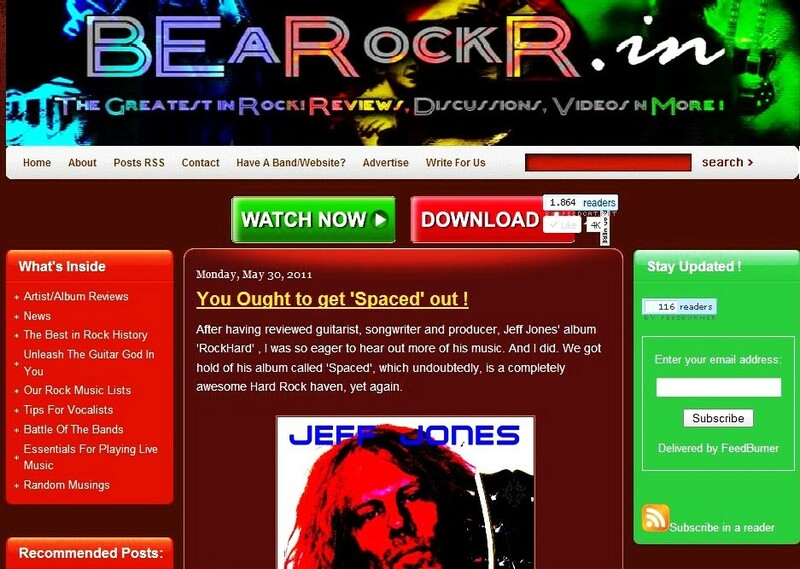 We got hold of his album called ‘Spaced’, which undoubtedly, is a completely awesome Hard Rock haven, yet again. The album got off to an excellent start with ‘Queen of Hollywood’, which began with a cool Rock n Roll riff. Excellent vocals, and a completely balanced track. Sounded like a power ballad of the 80s era. PERFECT is the word. ‘No Satisfaction Blues’ gave me a taste of the Scorpions, AC/ DC, a bit of Def Leppard too.This song sounded like it was influenced from a hell lot of bands. But I’m much a fan now of the riffs and the rhythm section of this album. ‘Hell To pay’ was a bit different from the previous tracks, with a dominating heavy riff, though with lesser variety in the vocals. All of us Rock fanatics surely miss the riffs of the 70’s and 80’s, with not many bands belting out such styles, but its so good to have artists like Jeff who are capable of producing those headbanging hard riffs all over again. Moving on to the next track, ‘Addiction’, and just again, another bloody damn COOL riff. Not only the riff but the mixing and mastering of these tracks are absolutely perfect. I had to hit the Play button again and again on this one ! The drums and bass were the highlights in ‘Resurrecting’, while the track ‘Control’ finally had an intro with the bass, and the overall rhythm was powerfully controlled by the bassist. Now this riff reminded me of Deep Purple. Reaching the next one called ‘Not your love’, I could surely say the style is changing, with the band putting a lot more variety in the album. Even the guitar solo really matched with the song title! ‘Hate me’ had a metal sounding riff unlike others, and in ‘Miss tragedy’, sometimes I could feel a Def leppard style in the vocals and also a lot of inspiration. But its good to have a return of power ballads. Moving further to ‘Bad motor girl’, I personally was looking for a ‘clean’ track, maybe on the acoustic. So it got a bit bore for me, but nevertheless, the mind blowing riffs kept me going ! ‘Bad Love’ pretty much was the best riff of this album for me. This riff was a lot original and creative. The album finally ended well with ‘Underground’, with a good job done on the drums, though the distortion could have been a bit low I suppose. Summing up, except missing out on an acoustic track, this album is ‘Riff-fully’ amazing ! You just CANNOT miss out on these power packed riffs. It was like a journey back in time to the Rock n Roll era of our idols: Deep Purple, AC/DC and Def Leppard to mention a few.